Hai 🙂 I am all bundled up today due to being real life sick, caught a cold earlier in the week and cannot get rid of it…so I am sleeping quite a bit to get it over with……I am not a good sickie hehe. So today I started with this fabulous skirt from Drift available at Fi*fridays. A few colors to pick from but I loved the texture of this one, so I piled on all the goodies I could dig out of my suitcase, starting with the gorgeous new Lumi 2 Mesh Hair with Texture Change Hud for the Hat from Wasabi Pills (there is a longer hair version at FaMESHed). 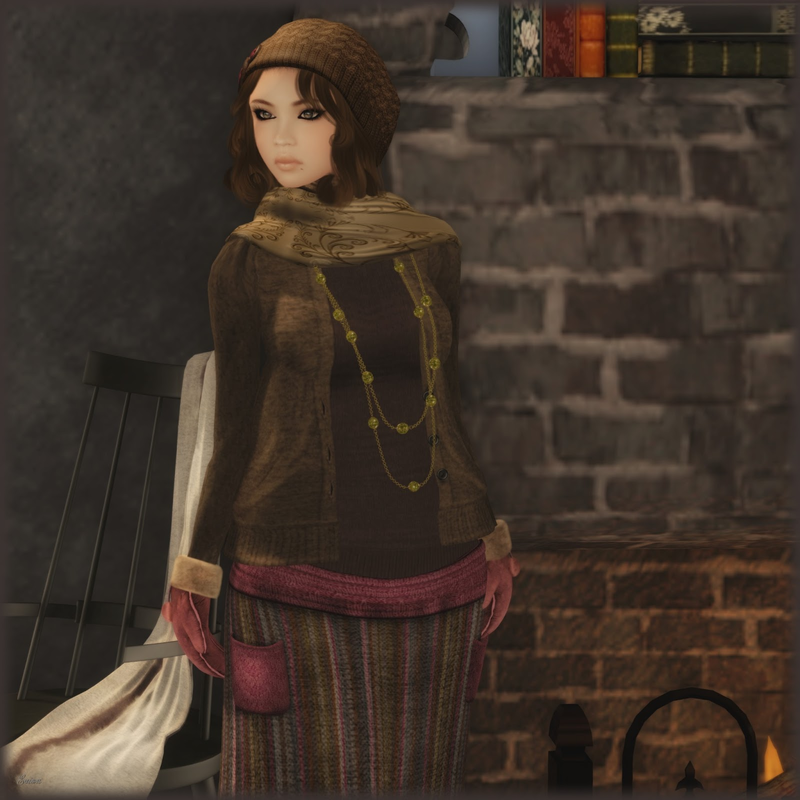 The Intemporel Scarf from Je Suis that is texture change, The lovely Lydia Necklaces from Maxi Gossamer also texture change, The cute little Brown Boyfriend Cardigan from Tres Blah, and of course the the Sheepskin Mittens from League. The Poses I am using are from Di’s Opera…..there is a wonderful fatpack 50% off sale ongoing…..I just love Di’s Poses immensely, if you are a pose hound like I am……make sure to visit 😉 I am still wearing this fabulous new Party Girl skin from Curio…….just cannot get enough of this most wonderful gift of having one of my favorite stores back! 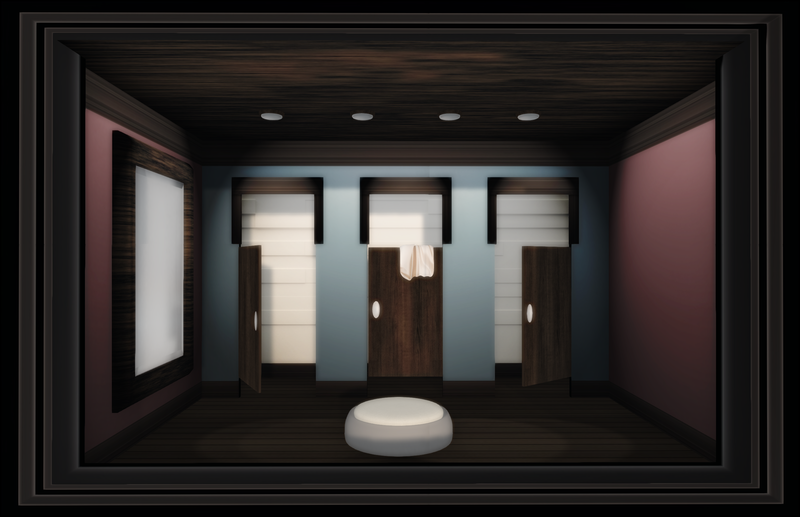 If you have not yet, join the Curio group inworld and enjoy this amazing skin! I went as far as my fireplace today and you can see I still have a few Xmas items out from Sway’s advent calender…..these items can be picked up still for a small price…..I just love the Rudolph Floor Cushions though hehe……..these may have to stay! Oh and this fantastic Frostbite Cottage is still available at Collabor88…..I had to run and grab a white version earlier………..this is a phenomenal home to have for such a wonderful price! Ok I am out to lay down and watch movies, but have a wonderful weekend and I will……………………. Ola! I have been super busy in real life these past couple of days…….cleaning….taking all the xmas decorations down……visiting and of course shopping all the boxing day sales hehe…..but I did have time to make it to FaMESHed! I simple adore this event with all the perfectly exquisite mesh items by some of my very favorite designers! Today I bring you a wonderful mesh Monique Suede Dress from Baiastice. I find I do not wear the color blue enough, as a brunette in real life I do not have much blue in my closet either, so this was a bit of a challenge for me hehe. There are simple an amazing assortment of colors to choose from for this fabulous dress……but the Blue/Cerulean caught my eye and I ran with it. Of course you can tell what song I was listening to when I took these photos……yes I changed the black to blue and even though this is a suede dress it simple looks like velvet to me….such a soft but smashing design, the Monique Dress is not to be missed! I have coupled this fabulous dress with a new release of the Charlie Mesh Bag, from Rebel Hope Designs, which comes with or without a pose and is also modify so you can resize this fabulous bag which I love……every so often I buy a bag and I cannot resize it, but it just looks to big for my avatar so there is not much I can do but get rid of it, but this bag is beautiful and comes in tons of colors and is a permanent staple for your second life closet as it is to mine 🙂 Pick this up as well from FaMESHed. The gorgeous Tinsley Cashmere Bow Scarf from Boom is available for just a few more days at Collabor88, so if you have not picked this scarf up hurry! The Carmen Savage Violet Blue & Python shoes are Decembers release from Miamai at L’accessories…………I am so in love with these amazing heels I think I own almost all the colors…..another fatpack I should have bought hehe. These come in a wide variety of colors in the solid tones at the front of the shoe as well as the Python textures at the back……these are just positively yummy, grab them up while you still can! Ok I am out for a small bit to get my next post up and running…Have a wonderful day or night and I will…………..
Ola, Tonight I am bringing you a few previews for the Together for Sway Event that will start on December 15th and run through December 31st. Sway, who brings us all a very Merry Christmas in Second Life with her outstanding advent event, not to mention her beautiful creations and sweetest ever Cookie Bears throughout the rest of the year, will be undergoing a very difficult surgery soon. Together for Sway is an event that we will all love. Shopping is something I think we all do well in our community and you will not believe what is available at this event! Some of SL’s most amazing designers are donating their fabulous creations to help Sway through this most difficult time. I hope you will join us throughout this event and give a little hope and joy back to one of the sweetest creators in second life. Now onto the goodies, yes? Exile has this amazing Sway My Way hairstyle out, it is a gorgeous updo with amazing tendrils that fall down your back and is available in regular colors as well as the new fusion textures! Sakide has these beautiful Lounge Cardigans out which come in a few different lovely colors, as well you must have the Snowy Pantyhose, you can buy the pack which include beige, pink and white. Duh! whom I adore has these most magnificent Classic Leather Pumps out, you can pick these up in three different colors as well…….and then last but not least is this delicate Tiny Little Snow Crystal Necklace from .O., I adore this fabulous little crystal as I have something similar in real life……..I am wearing this in Silver but it does come in other metals as well! Ok if I have not tantalized you enough, next up is the Winter Pavillion from Second Spaces…..this is a complete must have! The second part of my post today, I am walking around Hyacinth Lake, which is another wonderful wintery wonderland sim. This sim is residential and brand new. The whole area is built around this fabulous lake that you can walk around and of course if you are like me take pretty photos on. Hyacinth Lake is the sister sim to Effington Woods (where I currently reside) and is most beautiful to take in, the properties are a little larger but still very nice in size. I have no doubt that these parcels will be snapped up in a heartbeat, so if you are looking for a beautiful place to live teleport here and see what is available, just touch the sign to get a notecard of which parcels are open and then walk around and explore. I just adore being a part of this community and I am sure you will as well. Sean is most wonderful to work with and he really does care to make the people who reside on his properties happy happy happy! Ok I am off for a bit, but I shall return……until then have a wonderfully winter day! Ola, as I was dressing up in this very winter warm outfit from *TuttiFrutti*, I was thinking about where I was going to take these photos and low and behold I refreshed my adored blog list and Ziki had a new post out. Now I have been to the Water Reserve before to take in the beautiful scenery, but I had no idea they had winterized this gorgeous sim, until I read Ziki’s Blog. Now I adore Zikis’ photos immensely she has the most wonderful vision and simply no matter the context of her photos, they are always an amazing view of Second Life. Some may know her on Flickr, that is certainly how I found her, but Ziki’s Blog is just as magnificent. So if you are ever looking for some wonderful views of this world we love so much, please visit her blog! 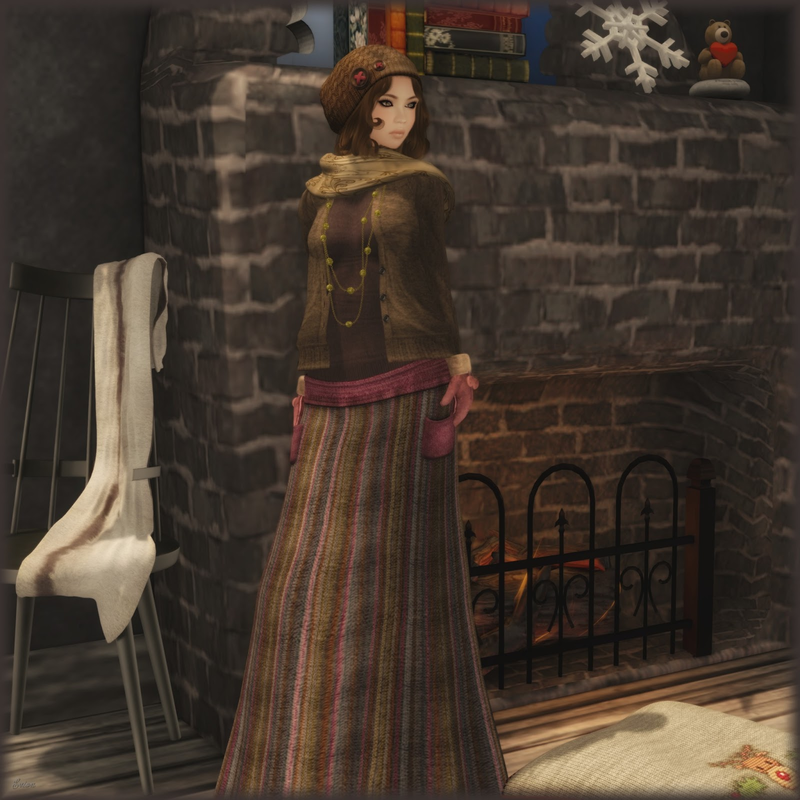 This outfit from *TuttiFrutti* is such a kewt ensemble and is a new release for the Peace On Earth Hunt 5. Wow seems not to long ago I did the original POE hunt, all 400 of the stores and it took me two or three days to do and this is round five……. where does the time go?! I am also wearing the beautiful new style of Oh from Analog Dog…..this is such a yummy style with the long flowing curls cascading out from the color change head band. Now while I was out just getting ready to take these photos……..I received the group notice I had been waiting for days now to get…….The New Glam Affair skin Amberly was out! So I totally high tailed it over there……………….and I love her to pieces so much so I had to wear her immediately, in fact this may very well be my favorite to date! I mean Glam Affair always has the most magnificent skins, but Amberly has these to-die-for glossy lips……..and the freckles that are available are just as scrumptious! If you have not tried her out, go and demo ASAP! Ok I am out for a bit but keep shopping and hunting and adventing and I will…………………………..